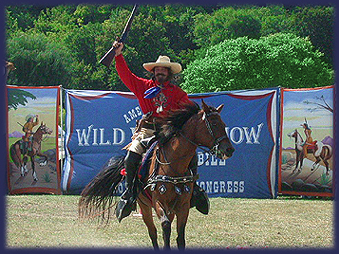 America's Favorite Wild West Show was created to depict a smaller version of the original Buffalo Bill's Wild West spectacle... smaller, because Bill Cody's show sometimes ran as long as three and a half hours, with a company of over 200 people, 180 horses, 18 buffalo, 10 elk, 5 Texas steers, 4 donkeys, and 2 deer. This was in a day and age when people were starved for entertainment and didn't mind sitting for so long! Here in the 21st century, the public craves shorter, faster-paced spectacles, so H-LAT offers several different versions of the Wild West Show. Our largest event (running 45 minutes to 1 hour) consists of 15 performers, 12 horses, 3 buffalos and a stage coach. We also offer a scaled-down version for smaller arenas; these entail less livestock, no stage coach, and fewer performers. Each act typically runs 30 minutes, and indoor shows may be performed at 20 minutes per act.